What Else Can I Expect from an Online Christian Counseling Program? Christian counselors provide traditional client-based therapy within the framework and values of the Christian faith. Christian counselors may specialize in all types of counseling, including addiction, marriage and family, youth, and rehabilitation counseling. These counselors are knowledgeable in their field and well-versed in biblical teachings and the fundamental principles of modern Christianity. All counselors who serve clients in private practice, including Christian counselors, must hold licensure in their state. Although licensure requirements vary by state, they typically include 2,000-4,000 hours of supervised clinical training and successful completion of an official licensing exam. Most Christian counselors in the U.S. hold a master’s degree, and many start their education with a bachelor’s in Christian counseling. Many students choose to pursue a bachelor’s degree in Christian counseling online. Web-based programs follow the same rigorous curriculum as classroom-based options. The asynchronous structure of online education caters to students with jobs, childcare obligations, and other responsibilities. This guide details what to expect when earning a bachelor’s degree in Christian counseling, as well as career opportunities and professional resources. WILL AN ONLINE CHRISTIAN COUNSELING PROGRAM PROVIDE ME WITH THE SKILLS I NEED TO ADVANCE MY CAREER? An online bachelor’s degree in Christian counseling provides the foundational knowledge and skills needed to succeed in a master’s-level counseling program. Students learn key counseling methods, therapy techniques, and strategies for serving different populations. They also study Christian values and beliefs. WILL AN ONLINE IN CHRISTIAN COUNSELING PROGRAM WORK WITH MY SCHEDULE? An online bachelor’s degree in Christian counseling offers a flexible alternative to brick-and-mortar programs. Students can access lectures and other course materials, submit written assignments, take exams, and contact their professors on their own schedule and from any location with a WiFi connection. WHAT JOBS CAN I GET WITH MY BACHELOR’S IN CHRISTIAN COUNSELING? Graduates from an online bachelor’s in Christian counseling program qualify to offer private counseling services in states that do not require a master’s degree for licensure. Bachelor’s degree holders who plan to practice in states where a master’s is required can tackle the demands of a graduate program. WHAT ARE THE BEST ONLINE BACHELOR’S IN CHRISTIAN COUNSELING PROGRAMS? 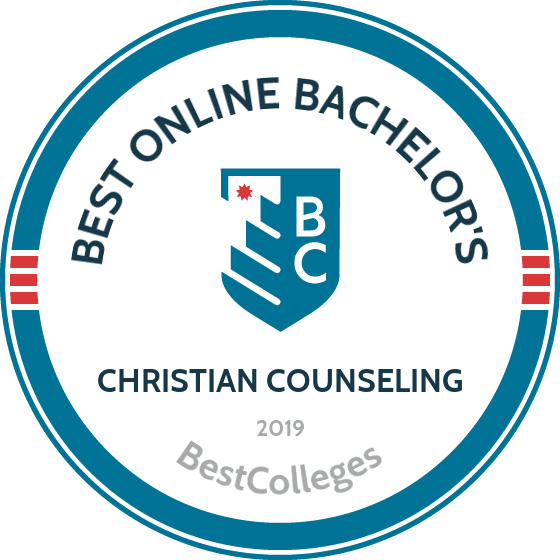 The best program for you depends on your needs and interests, but the following ranking serves as a helpful starting point in your search for the best online bachelor’s in Christian counseling programs in the United States. Based in Lynchburg, Virginia, Liberty University offers an online bachelor of science in psychology in Christian counseling program that covers scientific research and Christian theology. The program comprises 120 credits, which most students complete in four years. Students take psychology courses that provide a science-based foundation for complementary classes in religion and theology. The balanced curriculum prepares students to become effective, informed, and compassionate counseling professionals. The fully online Christian counseling program requires no campus visits, and Liberty delivers online courses in an eight-week format. Liberty demonstrates dedication to maintaining the affordability and accessibility of its programs. Students earning the Christian counseling degree online receive free electronic textbooks, which can save learners thousands of dollars per year. All online students pay the same affordable tuition rates, regardless of residency status. Inclusive admissions criteria make the program highly accessible; applicants must have at least a 2.0 high school GPA to begin the program in good standing. Liberty's generous transfer policy allows students to bring up to three-quarters of required credits from previous studies. The program offers multiple start dates throughout the year. The university holds regional accreditation from the Southern Association of Colleges and Schools Commission on Colleges. Based in Waxahachie, Texas, Southwestern Assemblies of God University was founded as a small Bible school in 1943. The university is now one of the region's largest and most respected Christian institutions. SAGU offers a bachelor's degree in community care and counseling program that prepares learners for careers in social work, ministry, agency, and chaplaincy. The curriculum comprises 126 credits, including 48 credits of required coursework that delivers practical skills and intensive instruction in scientific models of human psychology. Students explore psychology topics including child and adolescent psychology, developmental psychology, crisis intervention, and abnormal psychology. Students develop a foundation of clinical knowledge, and they examine counseling topics in a Christian context through courses in areas including social work, pastoral counseling, and spiritual development. Students in the fully online program have access to resources including a wellness center, counseling center, and career center. SAGU maintains small class sizes, so learners benefit from individual attention and instruction. SAGU offers lower tuition rates than many comparable institutions; undergraduate students earn their degree with an average of 20% less student debt than graduates of other private schools. The university holds regional accreditation from the Southern Association of Colleges and Schools Commission on Colleges. BCF offers an online bachelor of arts in psychology program that prepares students to build counseling careers informed by adaptable proficiencies grounded in psychological theory, research, and diagnostic techniques. Many graduates immediately enter positions in the field, while others pursue advanced degrees. The 120-hour curriculum comprises 42 hours of required psychology courses and 18 hours of biblical and theological courses. During core psychology coursework, students learn to apply qualitative and quantitative techniques to practical counseling situations. The program culminates in a counseling practicum and a directed research project in the student's area of interest. Students earning the Christian counseling degree online take foundational biblical courses and gain clinically informed psychological training and an advanced background in the Christian faith and dogma. BCF delivers online courses asynchronously, allowing students to complete coursework according to their schedule. The flexible asynchronous format is ideal for working professionals and students with personal obligations. Founded in 1943, the Baptist College of Florida holds regional accreditation from the Southern Association of Colleges and Schools Commission on Colleges. Despite its nominal affiliation with the Baptist faith, the school maintains an open enrollment policy and welcomes students of all Christian backgrounds. Online learners receive discounted tuition rates. One of the world's largest and best-known Christian educational institutions, Oral Roberts University's student population includes learners from all 50 states and more than 100 countries. The school's signature "whole person" philosophy emphasizes the intellectual, physical, and spiritual aspects of education. ORU's emphasis on helping students become well-rounded individuals prepares learners for both professional and personal success after graduation. ORU offers an online BS in Christian caregiving and counseling through the College of Theology and Ministry. This online Christian counseling degree requires coursework in areas including psychological principles, research methodologies, theology, ethics, biblical education, and hermeneutics. Graduates pursue careers in spiritual and lay settings, including positions as teachers, researchers, pastors, chaplains, and missionaries. Distance learners can view chapel services through television or internet. ORU offers a generous transfer policy, accepting all credits earned from accredited institutions. Students can also earn up to 30 credits by passing an exam or submitting a portfolio. ORU offers six start dates per year, and online courses last seven weeks. Oral Roberts University offers generous financial aid packages; the university provides an average of more than $15,000 per incoming freshman in grant and scholarship funding. Applicants must have a minimum 2.0 high school GPA and must submit ACT or SAT scores. Oral Roberts University holds regional accreditation from the Higher Learning Commission. The King's University offers a fully online bachelor's of biblical counseling program that prepares students to enter counseling careers in churches and other ministerial settings. Students develop a strong knowledge base, which can serve as a foundation for advanced studies in psychology, counseling, and divinity. Students earning the Christian counseling degree online complete 124 hours, including 54 hours of major coursework. Classes address psychology topics from a practical point of view to prepare learners for professional counseling practice. Coursework covers topics including family dynamics, human development, crisis management, group counseling, marriage counseling, life coaching, and child and adolescent counseling. Learners also take 15 hours of Christian foundation courses in areas including Pentecostal charismatic movements and the life of Jesus. Students can customize the degree through 12 hours of biblical and theological studies electives. Students complete a self-directed capstone project and an internship during their senior year; the supervised internship allows learners to apply classroom knowledge to practical situations. Transfer students can apply up to 90 previous hours toward the online Christian counseling degree. TKU maintains educational partnerships with a network of churches, and students who live near the school's Texas or Southern California campuses can combine online learning with some in-person classes. TKU holds accreditation from the Transnational Association of Christian Colleges and Schools and the Association of Biblical Higher Education. Crown College's online bachelor of science in psychology and counseling prepares students for a variety of career paths in religious and ministerial institutions, social work, and the private sector. The program is designed for both recent high school graduates and working professionals. Learners gain skills in four essential areas: human psychology, counseling theory, case assessment, and skills development. Unlike many online Christian counseling programs, Crown's program delivers a skills-focused curriculum. Courses in the 39-credit core examine the theory and practice of counseling, introduce students to established and emerging theories, and explore each theory's practical applications. An intensive Christian studies core comprises up to 21 credits of the program's 125 credits and covers topics including the history of the Old Testament and systematic theology. Learners can pursue an optional minor in drug and alcohol counseling. Online students access course content through Crown's proprietary online learning system, which is intuitive and user-friendly for new online learners. Crown delivers online coursework asynchronously and entirely online. Founded in St. Bonifacius, Minnesota, more than 100 years ago, Crown College maintains a low student-to-faculty ratio. Crown students must take at least one faith-related course per semester, ensuring that students develop a strong set of Christian values. Headquartered in Knoxville, Tennessee, with a second campus in Kissimmee, Florida, Johnson University offers a BA and BS in pastoral care and counseling. Learners in either fully online track complete a double major in counseling and theology. Students take courses in pastoral care, counseling, and Bible studies. The primary difference between the BA and BS tracks is that they require 52 credits of art electives and science electives. The program's pastoral care and counseling core familiarizes students with proven methods of mediating and resolving interpersonal and internal conflicts. Courses examine material from an intercultural viewpoint, helping students develop the empathy and sensitivity needed to assist people from diverse spiritual and cultural backgrounds. Bible studies and theology courses cover Old Testament and New Testament teachings. Students prepare for leadership positions in faith communities through comprehensive studies of religious and dogmatic values. Major coursework covers topics including biblical teaching and preaching, family services, and counseling ministry. Johnson University does not indicate a minimum GPA requirement. Applicants must submit high school or homeschool transcripts and ACT, SAT, or CLT test scores. The program format comprises two seven-week sessions per term, with three terms per calendar year, which allows full-time students to earn the degree at an accelerated pace. Dallas Christian College offers a bachelor of science in psychology and Bible degree through the FLEXCampus online learning platform. Students earning the Christian counseling degree online can pursue one of six concentration options; learners planning to pursue careers in counseling and community outreach often concentrate in life coaching, organizational leadership, or pastoral care. The life coaching track includes core psychology courses in Christian life coaching and prepares students to help others build happy, healthy, and spiritually fulfilling lives. Organizational leadership students explore multiple leadership styles and examine hypothetical and real-world examples of personality theory. The pastoral care concentration applies clinical psychology concepts within a Christian context, helping students gain advanced insights into conflict mediation and counseling methodologies. Dallas Christian College requires all students enrolled in at least six hours of coursework to complete Christian service duties. This requirement encourages spiritual growth and prepares students to become influencers and leaders. Learners can fulfil the service requirement through participation in various types of community service. DCC welcomes learners of all Christian denominations whose beliefs adhere to the school's statement of faith. Key tenets of the statement include belief in Christian unity and in the sanctity of the Bible as a core spiritual work inspired by the divinity of God. Southwestern College is a nonprofit institution based in Winfield, Kansas. Southwestern offers an online bachelor of arts in psychology program that includes intensive coursework in psychology theory and emerging research and a flexible set of complementary electives. These electives, which Southwestern calls "disciplinary perspective requirements," cover psychology's many analogues in the natural sciences, social sciences, and humanities. Though formally affiliated with the United Methodist Church, Southwestern does not compel students to undertake intensive biblical or theological studies. The BA in psychology program focuses on developing professional proficiencies and includes supplementary courses in subject areas that enhance students' communication and media literacy skills. Learners complete courses in ethics, professional communication, social psychology, and cognition. During their four years of study, students build a portfolio that demonstrates their academic achievements relative to documented learning objectives. Through a senior capstone project, learners build advanced research and reporting skills and identify a career path that fits their individual strengths and interests. Graduates pursue a variety of career paths, including roles in mental health counseling, social work, human services, and child custody case work. Additionally, many graduates pursue advanced studies in psychology. Applicants must have a minimum 2.0 high school GPA and must submit ACT or SAT scores. Established in 1914, Colorado Christian University consistently ranks among the leading religious colleges in the United States. The university maintains a close-knit, community-oriented campus atmosphere. Students in the fully online bachelor of science in applied psychology program benefit from small class sizes and skilled instructors with extensive professional experience. Applied psychology students can pursue an optional emphasis in biblical studies, clinical counseling, or criminal justice. The biblical studies emphasis takes a scientific approach to psychology in a Christian context through 12 credits of advanced, theology-based coursework. Students pursuing the clinical counseling emphasis explore theories and models of human behavior and interaction, which counselors use to support clients. The criminal justice emphasis applies psychology concepts to the study of criminal justice and focuses on the equal treatment of all individuals under the law. Graduates who pursue an emphasis can apply 12 credits toward a master's degree in a related field from Colorado Christian University. CCU delivers all program coursework online in a flexible, asynchronous format. The online BS in applied psychology program is ideal for working professionals and students balancing family responsibilities. Applicants must submit SAT or ACT scores and must have a minimum 2.8 high school GPA. Colleges and universities typically offer Christian counseling as a concentration of bachelor of psychology or ministry degrees. However, standalone online Christian counseling programs do exist to offer their own concentration options. Students can pursue a broad topic, like history, religious studies, or psychology or opt for a specialization, like family counseling, pastoral ministries, or youth outreach. This concentration covers human development across the lifespan and biological bases of behavior. Students learn how to observe human interactions and assess behavioral problems. They also develop counseling skills and provide mental health services to individuals and groups. In this concentration, students cultivate an in-depth understanding of the Old and New Testaments. Degree candidates develop communication skills that enable them to explain essential Christian beliefs and spark community engagement. They also develop servant-leadership skills that empower them to lead and minister to churches and other religious organizations. This concentration provides students with an understanding of how children and adolescents learn. Students apply this knowledge to develop effective discipleship methods and programs in diverse settings, including schools, churches, and community centers. The concentration also covers practical challenges, like program logistics, time management, and scheduling. On top of general education and major prerequisite courses, online Christian counseling students complete at least 30 credits of core classes. Fundamental topics include Christian doctrine, contemporary Christian practice, and the art of leadership. Distance learners can individualize their degree plans through specialized coursework and open electives. The list below details five popular classes in this field. The History of the Bible: This course covers the creation, transmission, and translation of the Bible. Students explore the canonization of Old and New Testament scriptures and how early theologians and scholars reconstructed relevant manuscripts to form a single text. As a foundational topic, this class benefits all Christian counseling professionals. Ministerial Ethics: Students examine the biblical figure of the minister and how that image evolved over time, highlighting the ethical issues ministers face today. By studying these real-world challenges, students develop personal ethics and professional priorities that serve as the groundwork for effective ministry, teaching, and counseling. Age-Based Ministries: In this advanced class, students learn how to teach and minister with respect to the learning styles, developmental stages, and spiritual needs of different age groups. Students study the personalities and interests of each age group, as well as ministry philosophies, program delivery methods, and alternative programming. The ability to deliver effective ministerial services to diverse persons proves crucial to all religious leaders and educators. Theories of Counseling: This fundamental class examines the traditional and contemporary paradigms of psychotherapy. Students develop eclectic approaches to individual and group counseling informed by Christian worldviews and ethics. Additional topics include personality development, systemic dynamics in family relationships, crisis intervention, and trauma counseling. Counseling Practicum: Degree candidates round out their undergraduate studies with hands-on training facilitated through a university partner. Most schools allow online students to complete practicums with organizations in their community, including relevant employers. This culminating experience emphasizes client interaction and counselor development. Students learn how to prepare and present cases, which then undergo peer review. Online Christian counseling degree outcomes vary by departmental focus and individual student goals. In general, bachelor's candidates develop an understanding of Christian texts, which informs their spiritual growth and allows them to communicate core beliefs. Students also gain practical skills in individual and group counseling across age groups. Communication: An integral skill, effective communication enables professionals to clearly and persuasively relay information to diverse audiences. Students learn how to organize information for oral, written, and multimedia presentations. Spiritual Growth: By studying the Bible and related theoretical texts, students develop a personal spirituality and an ethical code of conduct. They learn how to analyze and apply biblical teachings to preaching, ministry, and counseling. Program Administration: This crucial skill allows Christian leaders, educators, and community organizers to develop and implement programs. Students learn how to create budgets, gather funds, and recruit and train volunteers/staff. They also learn how to evaluate programming for ethical standards and effectiveness. Community Leadership: By synthesizing the previous skills, students cultivate the ability to engage their community and foster trust in church doctrine and services. They also develop outreach skills that enable them to partner with organizations to achieve common goals. Counseling: Students learn how to integrate church teachings with their personal faith to verbalize and apply counseling theory. Drawing on evidence-based research, learners demonstrate interpersonal, diagnostic, and treatment skills for emotional, mental, and behavioral health. How Long Does It Take to Get an Online Bachelor’s in Christian Counseling? To earn an online Christian counseling degree, undergraduate students complete at least 120 credits, which typically takes four years of full-time study to complete. Distance learners can expedite graduation by enrolling in accelerated or degree completion tracks. These intensive programs require a full-time commitment but allow students to earn their credentials in two years. Part-time attendance enables students to balance school with career and family obligations. These students typically obtain their bachelor's in 5-7 years. Through prior learning assessments, schools allow students to transfer credits for prior college work, volunteer positions (like church retreats and mission trips), and relevant work experience. Most schools enable distance learners to individually pace their schedule, taking as few or as many classes each semester as they want. Some institutions require distance learners to engage in cohort learning, in which case degree candidates take one class at a time and advance through the program at the same pace as their peers. To confer valid online Christian counseling degrees, colleges and universities must maintain national or regional accreditation. Schools become nationally accredited through organizations approved by the U.S Department of Education (ED) and the Council for Higher Education Accreditation (CHEA). They obtain regional accreditation through one of seven organizations -- also approved by the ED and/or CHEA -- depending on location. For example, Pennsylvania colleges apply for regional accreditation from the Middle States Commission on Higher Education. Accreditation indicates that an institution adheres to academic standards stipulated by government bodies and professional associations. On top of national and regional recognition, Christian counseling bachelor's programs can gain specialized accreditation from the Association for Biblical Higher Education (ABHE). Founded in 1947, the ABHE receives the support of the ED and CHEA. The association provides accreditation to individual academic programs and entire schools. The ABHE accredits institutions in the U.S., Canada, and related territories. Created in 1980 by President Jimmy Carter, the ED is a cabinet-level department that enforces federal education laws centering on civil rights and individual privacy. The ED does not directly establish colleges or universities. However, without the department's official support, higher education institutions cannot access federal funding, which includes scholarships and grants for students. Founded in 1996, the CHEA is a national nongovernmental organization that supports more than 3,000 degree-granting institutions. CHEA regulates qualities of academic excellence and operates national accreditation, along with the ED. The council also provides indirect accreditation through its 60 partner organizations. For more information on nationally accredited schools, visit the ED website and the CHEA website. Bachelor’s degree holders enjoy more favorable unemployment rates than those with lower educational attainment. According to the Bureau of Labor Statistics (BLS), the unemployment rate for bachelor’s degree holders is 2.5%. By comparison, the unemployment rate for associate degree holders is 3.4% -- and 4% for high school graduates with some college experience but no degree. The employment outlook for Christian counselors is strong, although unemployment rates and industry growth projections vary by specialization. The following table uses data from the U.S. News & World Report to explore unemployment and industry growth trends among some of the most common areas of professional counseling. The BLS notes that projected industry growth rates vary by specialty. In some fields, such as school and career counseling, industry projections land on par with the national average of 7%. Other fields, such as substance abuse/behavioral disorder counseling and mental health counseling/marriage and family therapy, look to grow at a much faster rate. Like unemployment rates and industry growth projections, the salary expectations for professional counselors varies by specialization. The next table explores career salary growth for five of the most common career paths for Christian counselors. Please note that these figures reflect trends for licensed counselors, most of whom possess a master’s degree. Of the five careers listed on the table above, school counselors see the highest salary growth, with a 46.5% increase between entry-level and late-career positions. Marriage and family therapists see their earnings grow by 46%, while career counselor salaries increase by 40% after 20 years in the workforce. Mental health counselors and substance abuse counselors round out the table with growth rates of 21% and 29%, respectively. Graduates with a bachelor’s degree in Christian counseling qualify for entry-level positions in some states, although most jobs go to candidates with a graduate degree and licensure. Below we review three of the most common professional pathways for Christian counselors. School and Career Counselors: School counselors help students of all ages improve their academic performance and tackle personal issues. Their daily responsibilities depend on the ages of the students they serve. Elementary and middle school counselors address fundamental knowledge and skill development while providing emotional support and treating behavioral issues. High school and postsecondary counselors usually concentrate on college prep and career development. Christian school and career counselors work at privately funded religious schools and institutions, along with private companies and organizations that offer faith-based academic and career counseling services. Mental Health Counselors and Marriage and Family Therapists: Mental health counselors offer services to clients with emotional or mental health issues, such as depression, anxiety, and mood disorders. They evaluate clients and diagnose conditions, provide therapy, and help clients cope with daily problems. Marriage and family therapists specialize in helping clients address issues related to marital problems, child care, personal finance, and other issues that affect the household dynamic. Christian counselors who specialize in mental health counseling and marriage/family therapy incorporate biblical teachings and faith-based values into their therapy sessions. Substance Abuse and Behavioral Disorder Counselor: These professionals, commonly known as addiction counselors, specialize in supporting clients who struggle with alcoholism, drug abuse, gambling, and other forms of addiction. Substance abuse and behavioral disorder counselors help clients identify the mental health issues and destructive behaviors that trigger addictive tendencies. They may also counsel clients who are in treatment and/or recovery from their addiction. Christian counselors who specialize in addiction counseling often use religious teachings and philosophies to help clients address their addictive behaviors. An online bachelor’s degree in Christian counseling prepares students for the challenges and demands of a master’s in Christian counseling program. You can learn more about these opportunities here: Online Master’s in Christian Counseling Degree Guide. Professional connections and continuing education prove crucial to professional success. Professional organizations offer many networking and education opportunities for counseling students and graduates. The list below includes four of the country’s most prominent organizations for Christian counselors. These organizations host networking events, provide online trainings, maintain active job boards, and offer other services for counseling students and professionals. American Association of Christian Counselors: The AACC is a faith-based nonprofit organization that represents nearly 500,000 licensed counselors, pastors, and other church personnel. Members receive access to complimentary magazine and newsletter subscriptions; webinars; continuing education credits; and exclusive discounts on books, conference entry fees, and other services. National Christian Counselors Association: Founded in 1981, the NCCA is one of the world’s largest organizations dedicated to training and supporting faith-based counselors. The association holds an annual conference in a different major U.S. city each year, and the website features an extensive counselor directory. American Association for Marriage and Family Therapists: The leading professional organization for counselors specializing in marriage and family counseling, the AAMFT represents more than 50,000 licensed counselors worldwide. The website features a job board and licensure links, an online information library, and a virtual networking center. American Counseling Association: Founded in 1952, the ACA is the world’s largest professional organization for counselors, with more than 52,000 current members. The ACA website features an extensive virtual knowledge center with information about licensure requirements, diagnostics, ethics, and other important areas of the field. Counselors also enjoy access to continuing education opportunities, journal publications, and an online job board. Despite the relative affordability of online programs, most students still need financial assistance. Students should complete the Free Application for Federal Student Aid (FAFSA) to learn their eligibility for federal loans, grants, and work-study programs. Additionally, private grants and scholarships are available through nonprofit organizations, companies, and other sources. Approximately 66% of today’s college students rely on loans to fund their education, but students enjoy access to plenty of overlooked financing options. Completing the FAFSA proves a crucial first step for any student seeking financial assistance. Our FAFSA guide features a step-by-step rundown of the FAFSA and answers frequently asked questions. Financial aid for online learning is typically equivalent to aid for campus-based learning. Click this link to discover funding opportunities available to online students. Online programs provide an affordable and flexible option for women balancing the demands of work, family, and school. This link lists valuable scholarships specifically for women. Online college programs are flexible and affordable options for single parents. This list of scholarships, grants, and other financial aid options caters to single moms and dads.